No great cook herself, Irma Rombauer collected recipes and kitchen techniques from friends and neighbors, and published a book to help ease the workload and stress of new homemakers not blessed with the services of a house servant or live-in cook. That was 1931, and The Joy of Cooking has been a treasured kitchen companion and teacher for millions of homemakers ever since. 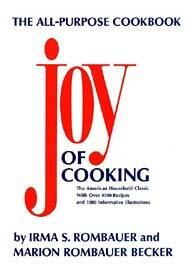 When you fancy preparing a particular dish, you’ll be sure to find it in The Joy of Cooking. This is why home cooks love it so much. The recipes (nearly 5,000!) are reliable with clear, no-nonsense instruction, and most often with useful variations. Best of all, they are easy to find and logically organized. Granted, there are lots of recipes in The Joy of Cooking today’s cook will likely not tackle—Tongue in Aspic is not necessarily the “fine-looking dish” that Irma recalls of the 30s, and muskrats have pretty much gone off our palates—however, this does not deter from the fun of reading about these recipes nestled between more popular and reliable fare such as Baked Macaroni and Cheese and Quiche Lorraine. In fact none of our other cookbooks offer a decent recipe for traditional Cabbage Rolls Stuffed with Tomatoes and Rice—a welcome dish on a fall day. Any new cook will embrace The Joy of Cooking for the in-depth cooking instructions, and the baking section alone is well worth the price of the book. There is much debate on the merits of the “old” Joy vs. the “new” Joy, and whether these changes—replacing information on canning and preserving with grilling and flavored oils for example—are a benefit to you as a cook. It’s a matter of personal choice… both are equally comprehensive, reliable, and trustworthy kitchen companions. You must have one, your choice on whether it’s the classic or more contemporary approach. We just keep stuffing the pages back into our copy of The Joy of Cooking, and would never part with the quirky illustrations, Irma’s enthusiastic, personal comments (“on your toes when you make this”… as way of introduction for Meal-In-One Sandwich) and the cultural history on every page—after all Shrimp Egg Foo Young and Spanish Rice were ethnic dishes in the 30s, and although we’ll certainly never “slaughter and empty out the intestines of a young pig while warm”… we find this pretty compelling reading.